-Beginning of channeled message- We wish to talk about freedom. 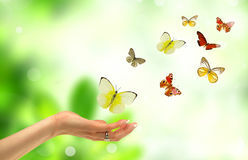 Freedom to us is that ability to be your true self with out any confinement from yourself or others. We feel as though sometimes humans trap themselves in their belief systems. We feel as though sometimes you confine yourself to old beliefs which disallows you to move forward. Through out your lives you are told a myriad of things and these things you come to believe weather it is true for you or not. We feel as though your beliefs and ideas start to conflict with each other. For example, you may have been brought up with the belief that money is bad or evil, but at the same time you wish to acquire it, therefore your belief and idea is conflicted. You may have an idea for a product but your belief that no one will want it will stop you from moving forwards. We feel as though society has put limits on what one believes it can or cannot do. As you believe these mentalities, the idea of being your true self starts to dwindle. We see freedom as the removal of all believe systems that negatively impact your true being. We feel that following the ideas that come to you, with out concern of others, is the best course of action. The opinion of others can be very influencing, but all they are is opinions. Do not take on other peoples belief systems for they are not in your shoes. Doing what you love to do is the greatest gift you can give to the world, for it shows an example for others to follow. Being your true self and following your dreams no matter what others say is how we see freedom. Now how to be your true self? Follow what excites you, for the feeling of excitement or joy is your indicator. We want nothing but joy in your lives but you seem to feel otherwise. We wish for you to remove beliefs that are negatively impacting you. Although this may not be easy at times, it is necessary. Take a good look at what your believe and see where these beliefs are stopping you. Find out what you wish to believe and find evidence to support it. If someone else can do it, so can you. We wish for you to remove the metaphorical cage that you have placed yourself in and find the freedom in being who you are.